Up at 4 a.m. to catch the sun rise, I was in awe of the morning sky. The strong wind and rain yesterday cleared out the air and, for the first time, I got to see blue skies and the mountains surrounding Beijing. Who knew??? Obscured by thick, grey pollution almost all the times I’ve ever been here, it’s quite lovely when the pollution is washed away. Too bad they can’t program a typhoon every week to clear it out. After Skyping with Thom, Hannah and a sleeping Mia, it was still only 5:30 a.m. so I decided to do a walkabout and see who else was up in my neighborhood. Surprisingly, I did see some joggers taking advantage of the clean air. Run while you can breathe! The street vendors were just hauling their carts out to make the morning breakfast for the commuters. That could be onion pancakes, eggs or steamed buns. Traffic was light and not the usual clogged mess on the “ring” roads. This trip I’m staying at the Westin near Sanlitun. I like this neighborhood more than the Grand Hyatt near the Forbidden City–too touristy for me there. 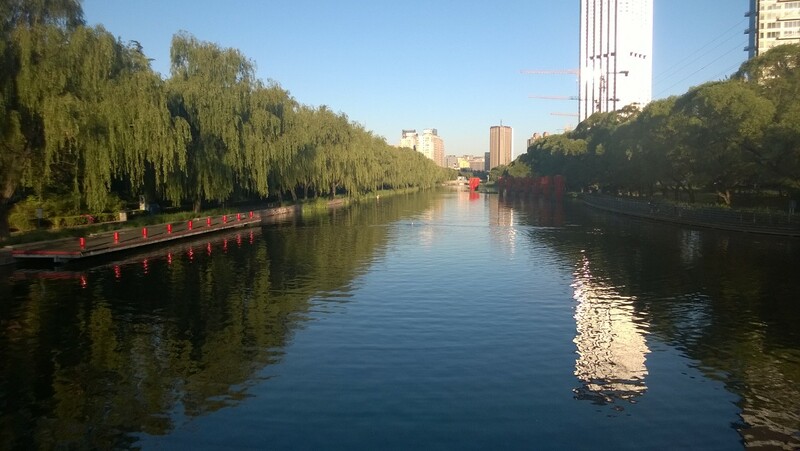 Here I can walk to more Western restaurants in the Sanlitun Mall and there is a nice canal next to the hotel. When I say “nice”, I mean picturesque but I would never, ever dream of swimming in it unless I wanted to die quickly of many and varied diseases. Walking by today, several gents were bathing/swimming in the canal in the early morning. One had on a bathing cap–cute but what you really need is some scuba gear and a full body suit! 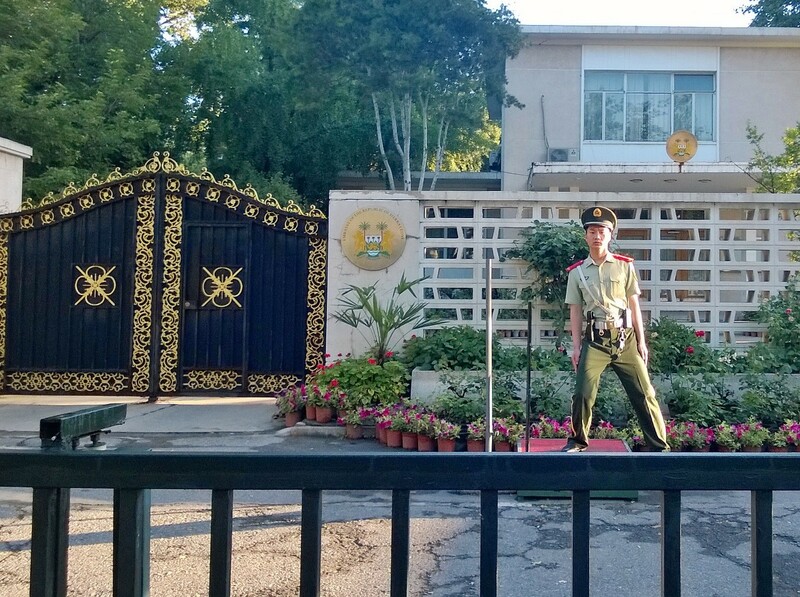 Guard at one of the Embassies coming to get me because I’m taking his picture! Canal near the Westin and bathing pool for some gents I saw today. I continued down Embassy Row where the guards were at attention protecting the occupants. As I looked at the bars on all the windows of the buildings inside the locked gated areas, I thought to myself that they probably need those precautions in case of a protest or attack but it wouldn’t make for very comfortable living. As I took a picture of the guard, he immediately started to come at me. Yeah, right buddy—you aren’t confiscating my phone. No way. No how. I just started walking fast and he backed down, returning to his post. I can’t even imagine how boring it would be to just stand in one place for hours. I wonder what he thinks about while he is standing prone watching and waiting. Are they so bored that they actually wish someone would attack them so they have something to do? I feel for them. No job is really easy but being bored is the worst. It’s the weekend but I am working straight through on my current project. No rest in sight and no Thom until July. Then, life will get better. In the meantime, I will put one foot in front of the other and wake up each day to appreciate the chance to live in the moment and look to the future. The blue skies today helped for sure! Yesterday, there was even a rainbow after the rain. Everyone was stopping to take pictures-I’m sure rainbows are unusual in the gloomy Beijing grey skies. I’ve always loved rainbows and think they are a sign of hope and renewal. As they say in Hawaii: No Rain, No Rainbows. Bring on the typhoons baby–I could get used to these blue skies in Beijing.